We present a numerical solution of the altimetry-gravimetry boundary-value problem using the finite volume method (FVM). 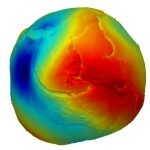 Such a numerical approach discretizes the 3D computational domain between an ellipsoidal approximation of the Earth's surface and an upper boundary at the mean altitude of the GOCE orbits. A parallel implementation of FVM and large-scale parallel computations on clusters with distributed memory allow high-resolution modelling of the altimetry-derived gravity disturbances over oceans. The key idea is to generate precisely the Dirichlet boundary conditions over oceans that are prescribed in form of the disturbing potential. For this purpose the geopotential on the mean sea surface is generated from the GRACE/GOCE-based satellite-only geopotential model and afterwards filtered by nonlinear diffusion filtering. On the upper boundary, the Dirichlet boundary conditions generated from the same satellite-only geopotential model are prescribed as well. Numerical experiments present high-resolution modelling of the gravity disturbances over oceans derived from the DTU13 mean sea surface model and the GO_CONS_GCF_2_DIR_R5 geopotential model up to degree 300. Their comparison with the DTU13_GRAV altimetry-derived gravity data indicates an importance of a-priori information about the mean dynamic topography, especially in zones of main ocean geosprophic surface currents.